Was taking a walk at my local wood and saw a large set of holes up the side of the hill. They are quiet big, if I wanted to I could fit my head down one of them with ease. There was large mounds of soil outside the holes, more so than Rabbits. There was not obvious smell, but there was what looked like dog poo in these small holes. What animal lives in these holes? Re: Rabbits, Foxes or Badgers? Sounds like Badgers to me, which is bad news for Hedgehogs. Badger holes are in the shape of a capital D turned on its side (the flat side). They dig pits outside the sett which they do their droppings in, these are known as 'Dung Pits' or 'Latrines'. The poo inside them looks like dog poo, as you said. There is usually large mounds outside the holes, which build up after years of using the sett. They can be found on hill sides. We have a Badger sett a few villages away. I bet no Hedgehogs live there, for Badgers are the Hedgehogs most natural predator. OK, thank you. I think you are right, I did some web research and it looks as if it might be them. Bad news for the Hedgehog though. Yeah, it is bad news for them. Badgers can get the Hedgehog to un-roll, and they will then eat the Hedgehog, leaving the skin etc still in tact, so it looks as though the Hedgehog has been eaten from the inside, if you know what I mean. Yuck! That is horrible. Have you ever seen a Hedgehog like that? I would not agree with killing the Badgers, but that sounds like one nasty death to me! I find all this information out from books I buy, I'm a bit of a book worm Sometimes I do research online, but I often find it is not as accurate. I would not like to end up dying that way either. The poor Hedgehogs. I don't have that many books. But I have to agree with you, they do contain a lot better information. I hope I don't see a dead Hedgehog when I go down to the Badger sett thing tomorrow. So they are not mindless killers, these Badgers, they don't go looking for blood? Their main food is the common earth worm, which they mainly forage for. But as said, if they should come across a Hedgehog then they might kill it. It has been proven that Hedgehogs are now in danger from foxes too, which have a different way from the Badger of killing the Hedgehog. The foxes will bite the Hedgehog's hock joint, on its back leg, and break it. Not a nice thing to picture. Poor, poor Hedgehog. That is really bad. Badgers and Hedgehog don't go together. The poor Hedgehog does not stand a chance against the Badger. Badgers killing hedgehogs is not a new happening. It isn't common but badgers do occasionally kill hedgehogs. It is part of nature, badgers have to eat too & although it's not a pleasant way to die it is no different to any other wild animal killing another in order to survive. There have been a few instances of foxes grabbing a hedgehog by the hind leg, maybe they were hogs with some kind of problem anyway! Again these occurences are very few & far between. 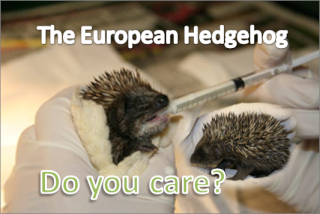 The main animal responsible for the decline of hedgehogs & most other disappearing wildlife is us human beings!!! Give badgers & foxes a break....they are just trying to survive!! Badgers are lovely animals, I went to watch them down at the local sett. And you are right, Wildliferescuer, they do have to survive, which we have to take in to account ourselves. As said before by me, Badgers are not mindless killers, and from lots of research I know that they do not go looking for Hedgehogs to eat, it may just happen occasionally when they come accross a Hedgehogs. As an all round wildlife lover, I am not going to shut off the Fox or the Badger because they may kill the Hedgehog. Hedgehogs are by far my most favourite wild animal, and they allways have been, so it is very difficult. The main big problem to Hedgehogs is humans, careless people who are not aware of the Hedgehogs.